Pyridocarbazoles when ligated to transition metals yield high affinity kinase inhibitors. While batch photocyclizations enable the synthesis of these heterocycles, the non-oxidative Mallory reaction only provides modest yields and difficult to purify mixtures. We demonstrate here that a flow-based Mallory cyclization provides superior results and enables observation of a clear isobestic point. 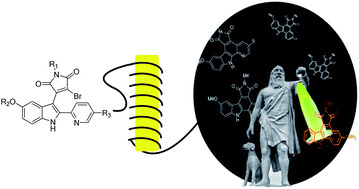 The flow method allowed us to rapidly synthesize ten pyridocarbazoles and for the first time to document their interesting photophysical attributes. Preliminary characterization reveals that these molecules might be a new class of fluorescent bioprobe.